Last week, I posted about breastfeeding (or rather, not breastfeeding and choosing to formula feed instead) on Espresso and Cream’s Facebook page. As I should have anticipated I got a lot of responses, some good and some filled with outrage. Because Facebook is short-form, I’m not sure my intent and thoughts behind my post were conveyed properly and with the clarity that I intended. I thought perhaps it was worth devoting a post to further clarification and explanation. When I was pregnant with my first and only child I got asked a lot by health professionals, friends and fellow moms if I was planning on breastfeeding. It was, by far, the most commonly answered question of my pregnancy. I found the questions strange. Sure, I hoped to breastfeed, but I had heard plenty of stories about women who couldn’t or chose not to, and I didn’t want to set myself up with expectations that were unrealistic. I’m the woman who went into childbirth with few notions of what I wanted or didn’t want. I thought perhaps I would like to try natural childbirth, but wasn’t sure. And after experiencing six hours of labor at home with contractions in frequent intervals I decided an epidural was the way to go. The same goes for breastfeeding. I thought I would give it a go, especially for those first few months when it’s extra valuable, but I didn’t have any strong leanings either way. I did, however, feel the societal pressure to breastfeed. Doctors, nurses, lactation consultants and friends all repeated the same phrase: Breast is best! Ainsley and I got off to a rough start with feeding. In the hospital she didn’t latch or eat well, and we spent hours with nurses and lactation consultants trying to get her to feed. And she did feed occasionally, but I didn’t have a lot of confidence in how things were going when I was discharged from the hospital. The first couple days and nights were filled with lots of tears on both my end and Ainsley’s. Listening to your baby cry and cry because they’re hungry is the worst sort of torture. I couldn’t understand what was wrong: I was producing plenty of milk, but our little one simply thrashed her head from side to side in frustration every time she tried to eat. It was emotionally depleting on me, especially when I was worried about a thousand other things and sleep deprived on top of it all. At four days old, Ainsley got admitted to the NICU with a low temperature after a home health nurse came to visit for a routine postpartum check-up. I had heard that breastfeeding was hard and I should just push through the hard to get to the other side, but in my heart I knew something wasn’t right. It was such a relief to hear the doctors and nurses in the NICU confirm that things were harder than usual for us because of the gap in the corner of Ainsley’s lip. That tiny gap was causing major issues with latching, leading to a lot of frustration for both of us. I was told that if we worked really hard we could probably salvage our breastfeeding relationship, but at that point I wanted nothing more than to pump exclusively and give Ainsley a bottle. She took to the bottle well, ate like a champ and was a completely different baby than the fussy, hungry newborn I had just a day before. It was sweet, sweet relief. At first, exclusively pumping felt like a huge weight had been taken off my shoulders. But eventually, pumping itself started to feel like a major burden on top of caring for a baby. There are many benefits to pumping and bottle feeding, but let’s face it, it’s double the work and difficult to manage time-wise with an infant who eats around the clock. During the first 14 weeks of Ainsley’s life, she was exclusively fed breast milk via bottles. I pumped dutifully and stored up a major stash in the freezer. I hated every second of it and felt emotionally drained. I must have threatened to quit a thousand times during those 14 weeks, but I felt so much guilt at the idea of introducing formula to Ainsley. I would ruin her gut health! She would have allergies! I wouldn’t be able to protect her from sickness and give her valuable antibodies! She would get more ear infections! The list could go on and on. And you know what? He was SO right. When I let go of the weight of pumping and breast feeding Ainsley, I was a better mom. I had more to offer her, I could enjoy her more and I felt more like myself than I had in months. My concern with the push to breast feed is that the focus of “breast is best” is so very narrow. Is breast milk the perfect food for our babies? Absolutely! And it’s so cool that our bodies can nourish our babies. But when the push to breast feed results in a stressed out, emotionally depleted and unhappy mom, sometimes formula is best, and that’s okay, too. So if you didn’t produce enough milk to feed your baby, it’s okay. If your baby didn’t latch well or had a medical issue that meant breast feeding was ridiculously hard, it’s okay. If you’re a mama via adoption and breast feeding wasn’t an option, it’s okay. If you just didn’t want to breast feed, it’s okay, too. My hope is that we can have fewer conversations about how we feed our children all together. It’s such a deeply personal choice that’s become public fodder. The way I see it, motherhood is hard enough as it is without carrying extra guilt or shame about how you choose to feed your baby, and at the end of the day, we’re all just trying to do the best we can. great post! I just quit breastfeeding my son the day after he turned one, and I can tell you that even with my over supply, hungry baby, and relatively ‘easy’ experience, it was a LOT of work. I will do it again in a heartbeat, but I 100% understand how for some people giving a baby breast milk exclusively just isn’t feasible. Our babies need or love and attention, and you are obviously a great mom to Ainsley, which is first and foremost the most important thing! “It’s such a deeply personal choice that’s become public fodder.” YES YES YES YES. I’m not a mom (yet) but I am a health educator and see how much pressure is put on moms to breastfeed. There are SO many reasons why women cannot breastfeed (milk production, anatomical issues, sexual trauma…the list goes on), and we need to make sure that we support those who can’t (or just don’t want to!) and not make them feel like they are terrible human beings. Every momma is doing the best she can for her and her baby, and it rarely ends up looking exactly like the mom next to her. I praise you for your brave and wise words! In the hospital, I was genuinely shocked by how much the med community pushes breastfeeding. I met with, no joke, at least 10 different people while I was staying there… none of them solicited (!!). The pediatrician wanted to ask about my latch, the OB/GYN wanted to know how things were going, one lactation consultant wanted to know if I touched the baby’s face while he was feeding, another said never touch the baby’s face while feeding, a nurse’s assistant wanted to see me feed, etc. etc. And it keeps going! When I go to the doc, when Rocco goes to the doc… oy! It’s unbelievable. Especially because at the hospital I was recovering from a 3-day labor and emergency c-section and full-on anemia and then I was being pressured (and that is the word I would use: pressured) about this whole breastfeeding thing. We weren’t having problems but I started to worry about problems just because all these people were freaking me out. I was just like you in terms of expectations, I wanted to try it but didn’t feel like the world would end if I couldn’t keep doing it, in part because I’d been exposed to posts like this (http://www.turntablekitchen.com/recipes/here-goes/) and articles like this, which is super interesting (http://www.theatlantic.com/magazine/archive/2009/04/the-case-against-breast-feeding/307311/#), but the pressure almost made me want out by itself. Anyway, my take on the breastfeeding posts and special week is that breastfeeding is hard, it just is, and anybody who says it isn’t either got super lucky or has a bad memory or is lying. And when you’re doing something hard–not just breastfeeding, but as an example–you want to know you’re not alone. Same for natural childbirth or for doing Whole 30 or trying a new workout program or whatever. So things like these come about. And I will say, 6.5 weeks in and feeling the worst ever (!!!!) at managing feedings in public, I do like seeing the social media posts because it feels empowering to insecure me, like, hey, some other people aren’t embarrassed by this and they make it work, cool. But it shouldn’t be any kind of commentary on not-breastfeeding. The comments, and I know they’re out there, or even the subtle shaming is ridiculous and unnecessary and I think at its heart it’s just another way for people to make themselves feel better than one another because deep down they’re insecure. I get that because I’m like that deep down, too. also ps “breast is best” is the most annoying promotional phrase, let’s get rid of it! also pps didn’t realize I had so many thoughts on this until I started typing, ha! mom brain. Yes and yes again! You nailed it with this post. What is best is dependent on the situation and there is not way to group everyone together to say one single way is the best. I breastfed for a year but we were lucky and had no issues. I never judge someone that did not since there are many reasons why it is was not best for them AND really is it my business? No it is not. This resonates so well with me. I have 7 month old twin girls that were born 6 weeks early. I had to pump for them from the get go because they spent 4 weeks in the NICU. I tried to breast feed them in the NICU when I was there and pump while at home. After they got out of the NICU, I tried to continue doing both and it was hard. I would breast feed each, pump and then bottle feed them because they never got enough out of my breasts. It was a cycle that would take 1 1/2 hours usually. I was exhausted. Then I got mastitis which turned into a breast abscess and had surgery on it. I quit breast feeding after that (too painful with an open wound for 5 weeks) and only pumped. This has been so much easier for me. I am currently 7 1/2 months pumping and started the weaning process. I should be done around 8 months and then have a small freezer stash to get my girls to around 9 months. But they have had a formula feed a day for about a month and a half to get them used to it and because my supply can’t keep up with them anymore. And that is ok. It is ok to feed your child formula or breast milk by the bottle or breast. We are all nourishing our children and that is all that matters. Each person’s journey is different and that is ok. To each their own. Thank you for sharing this. I’m so glad you took the time to share more thoughts—this is a great post and an encouragement to those who have struggled with breastfeeding, no doubt! I sort of had the opposite problem—a baby who REFUSED a bottle no matter how hard we tried. And boy, did we try, haha. So I’ve had to embrace the other end of the spectrum—breastfeeding him (“straight from the tap, as I call it) for the past 10.5 months and dealing sometimes with the strange looks people give when you are nursing a child who looks like a 2 year old in public. Especially in the early days, my nursing cover and the backseat of my car were my saving graces. Allllll that to say, I think there should be no shame in how we feed our babies. We should be able to formula feed or breastfeed without judgement—the best thing for our babies is what’s WORKING for our babies, right? Xo! Very well written and I couldn’t agree more! I love this post, Madison! Seriously, kudos to you for handling this conversation in a mature and wise way. What every mom/family decides to do with feeding their children IS the best choice, regardless of what that looks like. p.s. 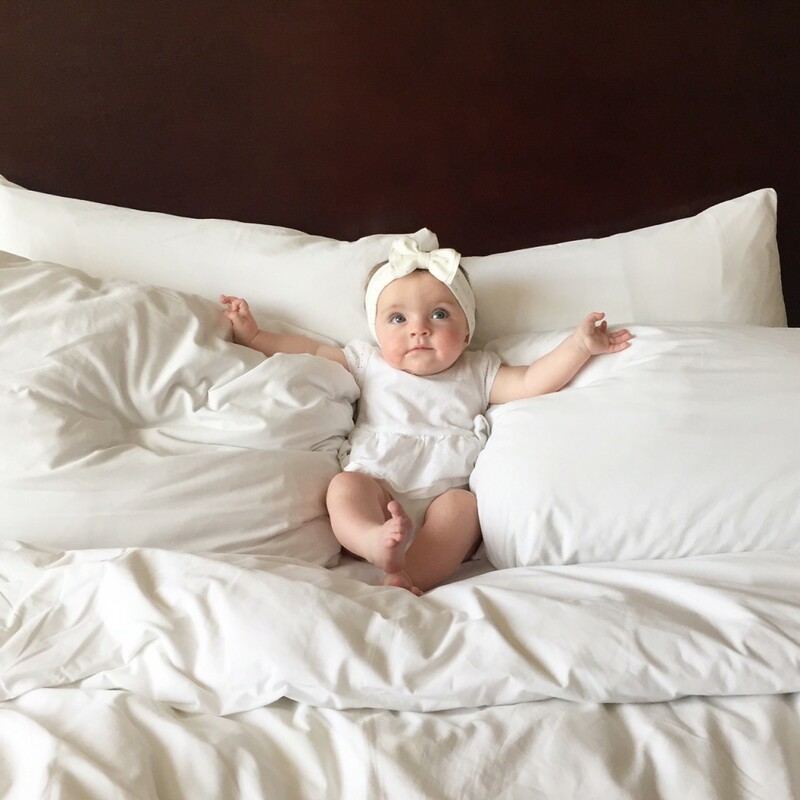 Love that pic of Ainsley – what a sweetie! Great post!!! My son had so many issues with latching and I felt horrible, but he bottle fed like a champ. My daughter took right off with breastfeeding and did for 2 years. They were just different kids. Still are. And you know what? He’s never had an ear infection and she had so many that she needed tubes by 9 months and the repeated antibiotic use damaged her teeth. You have to do what you think is best….for the whole family. It all comes down to you are her mom and you know what’s best! I’m due in two weeks, and I don’t want to breastfeed. I’ve done my research, I know the benefits, but I’ve never had the desire to do so, and I still don’t. I’ve had to explain myself a lot already (to nurses, friends, etc. who ask what my feeding plans are), and I’m not sure it’s fair. I’m sure people will call me selfish, but I have to do what’s best for me and my family. I’m an anxious person as it is, and I think that I’d resent the baby and my husband by doing something I have no desire to do. If I suddenly change my mind when she comes out, I’ll figure it out then, but right now, I think this is what’s best for us! Such a great post. Both by babies had a little breastfeeding and then formula. So much pressure and we should just support each other as mom’s! When a baby us fed however they are fed they are happy which makes mom happy! Well done Madison! Nothing more annoying than people who judge without knowing the reasons behind someone’s decision! Breast feeding is good for the baby but so is formula and what about what’s good for mum too? Surely her feelings should be taken into account! And wat about women who smoke and drink and have a poor diet? Surely their babies will be better off wot the bottle! In UK they were (and maybe still are) considering offering mums in areas where they are less likely to breast feed £200 to do so! That’s £200 of tax payers money that could be spent on treating a sick child or providing support for elderly people, not bribing young women who will spend it on cigarettes and clothes! The pro breastfeeding lobby annoy me but that’s not because I don’t think it’s a wonderful start, just that it’s not that easy for everyone! This is a great post. I get so angry when people share their opinions about which way is “best”, and try to force their opinions on others. What is “best” is what works for you and your baby. I don’t know how or why being a mom and the decisions you make became other people’s business. Just being a mom is hard enough, without all of the baggage people put on you. Love this. I have twin boys and gosh did I ever have a hard time breastfeeding. One of them didn’t latch because of a crooked jaw as a result of being squished in utero. I pumped (and breastfed when I could ) for nearly 4 months and it sucked the life out of me. One day I just said I was done, and I never looked back. People tell me I should be proud of breastfeeding my twins for 4 months. I tell them I’m proud that I switched to formula. It’s what enabled me to give them my best. Wish this post was around 10 years ago when I went through the same experience. Even reading it today brings some healing to the pain I felt years ago! THank you! I could’ve written the same thing…this was me nearly verbatim. I felt so guilty because I had the milk, but it just wasn’t working (we were both stressed out!). And it feels awful to actually dread feeding your child! After we corrected her lip and tongue tie, it was too much to have to still teach her how to nurse and I would still have to pump. So I decided to pump exclusively and at 14 weeks I dropped pumps and we introduced some formula. I was a much better momma and we were still bonding over bottle feeding when I could still snuggle with her and kiss her. She could still look up into my eyes. You are not alone in your experience. The right decision is what is best for you and your daughter, whether it’s breast, bottle, or both. The infant time is so short, and precious moments stressed over how to feed, are just not worth it.